Using Docker on a Synology NAS has become really easy. It’s a bit harder to install Jenkins in a container and let it use the Docker installation it’s part of. But we are living in exciting times: bringing a fully functioning CI/CD-pipeline to your home automation has never been easier! This blog is sort of a “this is how I did it, because I won’t remember how I did it in a few months”-blog. Not sure if it fits your case, but please comment if you feel like I’ve forgotten something. Synology + Jenkins + Docker = a match made in heaven. Ideal for getting you CI/CD going at home. Jenkins CI will use the “host” Docker of the Synology. To prepare we need to install Docker on our NAS. We also need SSH access, because some actions cannot be done from the Synology interface. Search for “Docker” and install the package. Search for “ssh” and click the “Terminal & SNMP” item. Click the Enable SSH service checkbox. Let’s configure a few things. Jenkins will need to persist its information, so I’m going to create a directory where it can store the data. The container user need to access the information as well, that’s why I’ll make sure it can be accessed. It also needs access to Docker. Now we are ready to bring the container up. We’ll bring it up under the name “blueocean”. I’ve added an A-record to the DNS-record of my domain and pointed it to the IP of my home. This allows me to access Jenkins on something like https://jenkins.keestalkstech.com. I’ve used port-forwarding on my router to forward 443 needs to the Synology NAS. Search for “reverse” and open up the “Application Portal” item. Click on the second tab named Reverse Proxy. Click OK and you’re done with the proxy. Search for “certificate” and open up the “Security” item. Click on the Certificate tab. Next click on the configure button. 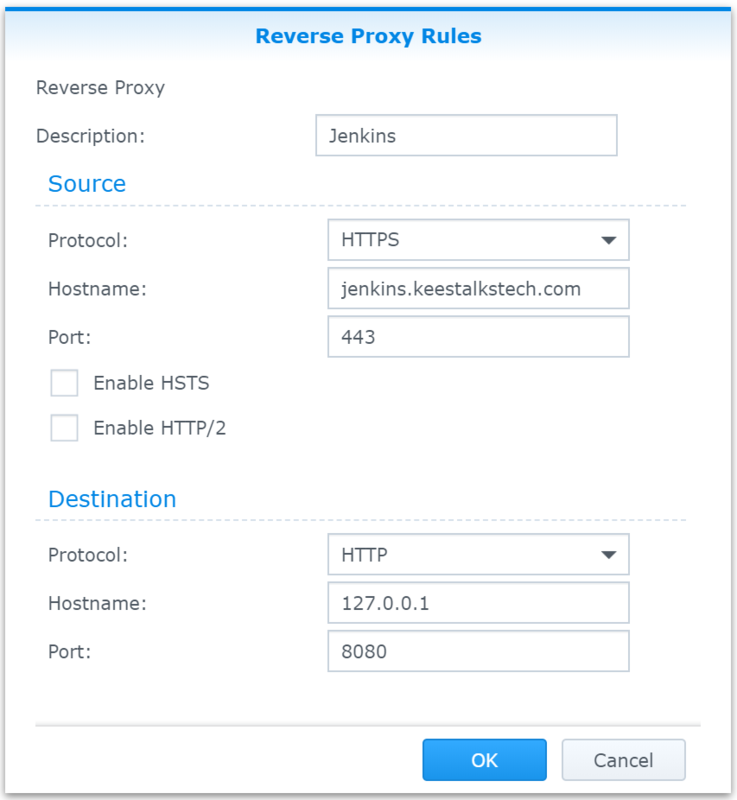 Now link the reverse proxy you’ve created in the previous step to the right certificate. Login using the temp admin key, complete the setup by creating a user. 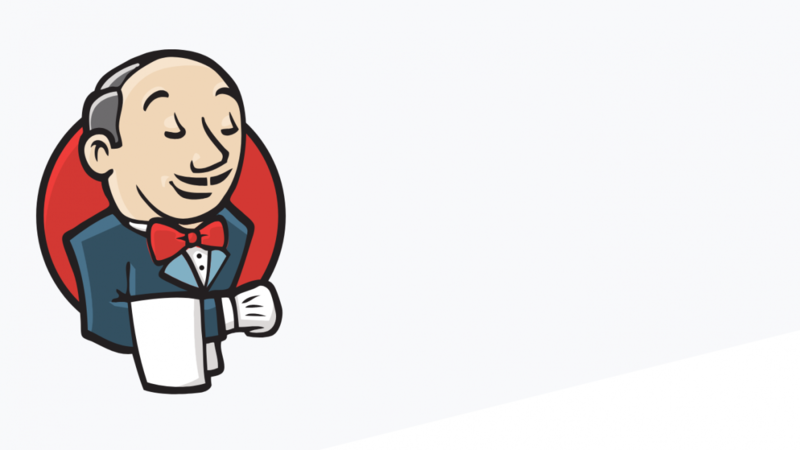 Login to Jenkins with the user. Go to Manage Jenkins (in the menu). Navigate to the Jenkins Location section. Add your domain here (in my case: https://jenkins.keestalkstech.com). Now we’re going to download the update. The following downloads an update to the latest version. So that’s the update for Jenkins itself. Now you’ll need to update the plugins. Make sure you visit the /pluginManager/ to update all plugins. So everything works. We have a working and updated Jenkins / Blue Ocean installation behind an HTTPS reversed proxy that can access Docker. Hope you’ve enjoyed the setup.